The first book that parents bring for their little baby is My First Book, a book that has lots of pictures and the alphabet. 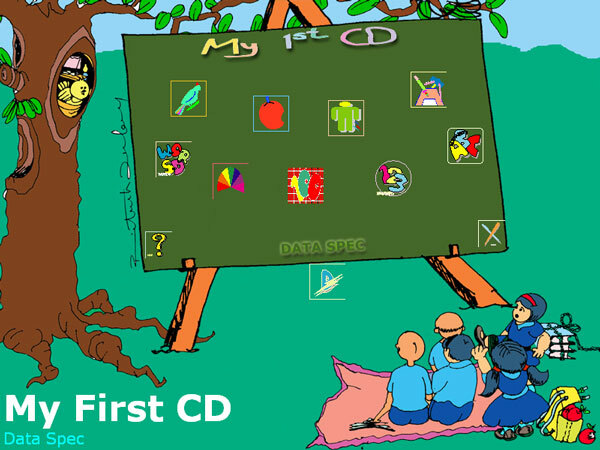 My First CD has been developed on similar lines as the first CD that parents with computers will want their little ones to have. My First CD has a very simple interface. Children with little exposure to handling the mouse are able to easily master it. The software has deployed an intuitive interface that permits the usage of both keyboard and mouse to navigate through the multimedia content. The CD has a section of pictures of some of the common things available around us with audio explanations for each of the words. The section introduces its user to number from 1 to 100. The child can select the number he wants to hear from the list on screen or he can listen to them in sequence using the software’s “Auto” button. Writing numbers and the alphabet The last section of the CD is about writing the alphabet. This section has an animated display of how each and every letter of the alphabet and number should be (drawn) written. You need a multimedia computer system with CD drive and audio support. The CD is configured to autorun as soon as it is inserted in the CD drive of the system running Windows 98, Windows XP or above. No setup or other files need to be copied onto the computer to run the software.